Getting started is easy and providing you know your business processes to hand, eg: pipeline value, it is also quick. 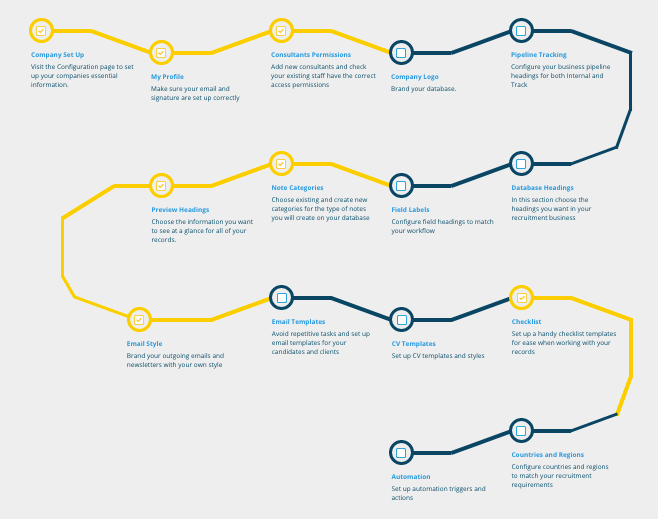 The easiest way to get your system configured to match your recruitment processes is to use the 'Get Started' road map. The road map is available on your dashboard and can be turned off or back on in the system settings section. The road map is essentials a checklist guide that redirects you to the relevant area of your system to allow you to configure your database, for example click the 'My Profile' link to set up your profile settings, signature, exchange details etc and when you are done, click the tick box to change the colour on the road map. You will know you have finished when it is all lit up in Gold!! !